Elementary Teacher at J. A. Coles School in Scotch Plains, NJ. As part of a Social Studies unit on Native Americans, this art lesson ties together the writing process in Language Arts, the historical facts, and the creation of original sand paintings. The children write Navajo journals pretending to be a Native American for four days. The art project is set up as a learning station and each child rotates through the station. After lightly penciling in their sketch of the land and environment of the Navajo, the students receive brown construction paper cut to about 6x8 inches (152 mm - 203 mm). At the art station, the tempera paint has been mixed with sand (any kind will work) and placed in egg cartons. The children recreate their sketches and design original journal covers for their writing. They paint the paint and sand on the covers. When dry, the brown paper gives the impression an animal hide has been painted. Attach the "hide" to journals. They also make a beautiful bulletin board! A different effect can be achieved by mixing dried temperas with sand. This mixture is then poured on glue and then allowed to dry. Sand Painting- An art lesson by Kinder Art. 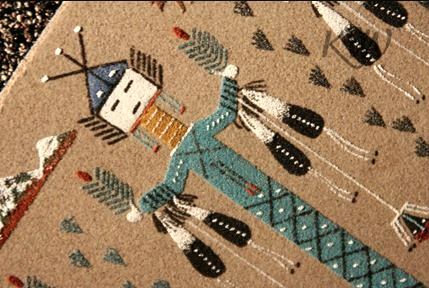 Navajo Sand Painting- A lesson by Eduscapes. Lewis & Clark Unit- See another IAD lesson that integrates Native Americans into history and art. Native American Designs: Create 8 Beautiful Paintings Out of Sand! - This sandpainting kit contains everything that children need to create eight sand-art images based on Native American objects and designs, including a buckskin robe, a tepee, and a warbonnet, among others. History of the Navajo can be included in this lesson. There are a few books that could help enhance the lesson into the history and art of the Navajo. Colors of the Navajo - Uses colors to focus on the history, culture, and physical surroundings of the Navajo Indians. The Navajo (American Indian Art and Culture) - This book covers the art and culture of the Navajo.